Website builders have been around for decades but a new generation now exploit new technologies like responsive and mobile platforms. A website builder can help individuals or businesses build anything from a simple single-page site to a professional web store, even if you've no design or HTML experience at all. Whether you're a sole trader or a multinational corporation, just about every business needs an online presence – in other words, a website. A growing number are adding bells and whistles like an email list or form facility, domain name registration and much more. More experienced users can customize and fine-tune the design to suit their own needs, or perhaps install a more traditional web design package that allows them to build the perfect site from scratch. There are free options, but these often have major restrictions, including limits on the size of the site and the lack of any ability to use your own domain. Fortunately, the commercial options are very reasonably priced, from around £5/$5 to £10/$10 a month, with hosting included. To help you decide which option is best for your needs, we’ve picked out the cream of the crop: these are the five top players in the website building world right now. Wix is one of the most popular online website creators, offering a range of plans and products. The free version has Wix branding, limited storage space (500MB) and bandwidth, but move up to the most popular plan (unlimited) and there’s no Wix ads. You get unlimited bandwidth (hence its name) and 10GB storage, along with a free domain, Google Ad vouchers and much more. The e-commerce plan adds an online store along with 20GB storage for a reasonable $16.50 (£12.30) per month. An excellent collection of 500 plus templates gets the design process off to a quick start. The drag-and-drop editor gives you all kinds of tools and features to explore – an image editor, video backgrounds, animations, social buttons, an integrated site blog – and just about everything can be tweaked, tuned and restyled. Furthermore, as of recently, Wix introduced Wix Turbo, which increases the speed and performance of websites substantially. All the core editing functions are really smartly designed, and operate more like a native app than your average website builder. Wix does have some weaknesses, with tech support seeming a little sluggish and limited in some respects. But there’s no denying that the superb editor and range of top-notch templates make it easy for web building novices to create something impressive. There’s a lot to like here in terms of a powerful drag-and-drop editor bristling with professional features and highly customizable templates, but at the outset, let’s make it clear that this isn’t the cheapest service around. There’s no free plan (or indeed trial – although there is a 30-day money-back guarantee), and the most basic plan is priced at $1 (£1 for UK) a month for first six months, rising to $7 (£7 for UK) afterwards. That gives you unlimited pages and web space, a simple integrated blog, limited SEO settings, plus website backup and restore, so it’s a touch pricey for what you get. That said, 1&1 IONOS MyWebsite offers a wide range of responsive templates, and an editor which provides loads of potential adjustments and tweaks, all with plenty of visual feedback and context-sensitive menus to help streamline the whole process. What’s clever here is that the top-level stuff is easy to use and understand for beginners, yet expert users can dive more deeply into the menus to really play around and customize elements. You also get your own personal consultant free of charge. Other highly useful features include the ability to point to your old website in order to import media content from there straight into your new site. This could be a huge timesaver for some. There’s no e-commerce plan here, but there is a separate Pro plan for that functionality (starting at $1 – (£1 for UK) – a month for the first six months, rising to $25 - (£25 for UK) a month). Weebly is one of the few website builders that offer a free hosting tier. Weebly is another big name in the website building world which offers a powerful editor and capable set of features. There’s a free plan, which like Wix limits space to 500MB and imposes ads on your site. However, if you move up to the Professional plan – at $12 (£9.5) a month – the ads and storage limit are dropped, plus you get a free domain, and even support for a web store containing up to 25 products. The supercharged Business plan lets you create sites with unlimited web store products and high-end store features like product reviews and discount coupons, retailing at $25 (£19) a month. The service offers hundreds of professionally-designed web templates, covering just about any site type. The drag-and-drop editor is neatly designed, although you don’t get full control over where you can position elements on the page, and the interface can seem a little cluttered. A further niggle is that there is no global Undo feature. 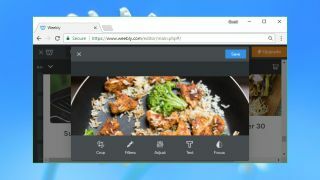 Like Wix, we found tech support was a little wobbly in terms of sluggish responses, but Weebly offers a host of powerful features, some very stylish templates, and easy access to free images for your site is another definite boon. As we’ve seen, many a website builder pitch themselves towards novices and making life easy for the less site-savvy out there, but what about experts who want powerful low-level control? Those are the users Voog has in mind. For example, clicking a text box gives you the option to use bullet-point lists, insert tables or videos, or even edit the HTML source to customize effects. Voog also lets multiple users easily collaborate on a site project, and if you’re after nifty, unusual features like these, you won’t see them elsewhere. The entry-level Starter plan is priced at $7.40 (£5.30) per month (billed annually) and gives you 2GB storage, and all the core features you’ll need, including SSL security (although it’s limited to 30 pages). If you know what you’re doing in terms of website design, and want some true power and customization capabilities, there is a 30-day trial you can check out (no credit card details needed). Jimdo is a somewhat quirky website builder targeted largely at novice users, but it’s well worth your attention for a number of reasons, not the least of which is a free plan which boasts more than the average offering. Yes, there are the usual limitations including adverts, a 500MB storage limit, no custom domain, and very limited SEO. But there are a few features you won't get in other free plans, like a password protected area, for example. The site editor itself is simple and consistent, even if it’s somewhat unconventional in terms of its design. Also, the editor doesn’t have as many functions and features as some rivals. For example, there aren’t that many templates, and the widgets on offer aren’t as plentiful as you might find elsewhere – plus there’s no global Undo (although Jimdo isn’t alone in this respect). Another neat touch is a good web knowledgebase which means help is generally close at hand when it comes to troubleshooting. Overall, this is a compelling product, that is well worth giving a whirl.